The Gillard Government's new front bench line up has seen the shock demotion of the Parliamentary Secretary for Social Inclusion and the Voluntary Sector, Senator Ursula Stephens. The Gillard Government's new front bench line up has seen the shock demotion of the Parliamentary Secretary for SocialInclusion and the Voluntary Sector, Senator Ursula Stephens. A spokesperson for Ursula Stephens says the demotion was a great shock to the Labor Senator for NSW. Commenting on the Gillard Government's Ministerial announcement, Adam Smith, the former CEO of the Foundation for Young Australians says that while the new front bench may be a strong line-up for the sector it is so very disappointing that Ursula Stephens was pushed aside in such a poor fashion. Smith says her integrity and passion for the sector's work was consistently outstanding and he's sure she will be missed. Pro Bono Australia Founder, Karen Mahlab says Senator Stephens initiated wide ranging consultations with diverse groups of people and organisations at a time where some big thinking about the sector was needed. Mahlab says the Sector must make an effort not to lose the momentum she created. The CEO for the Centre for Social Impact, Prof. Peter Shergold has also paid tribute to the commitment and enthusiasm of Ursula Stephens saying she did a fine job consulting with community organisations and ensuring that their diverse voices were heard. 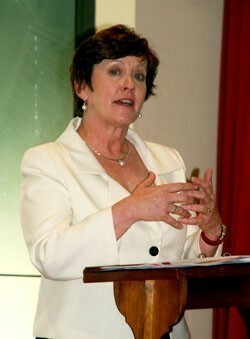 Ursula Stephens was elected to the Senate for NSW in 2001 and re-elected in 2007. She served as Parliamentary Secretary for Social Inclusion and the Voluntary Sector in the Rudd Labor government where she constructed an ambitious change agenda for Australia’s third sector including pushing through a National Compact between Government and the Not for Profit sector. Prior to entering parliament she served as Chair of the NSW Rural Communities Consultative Council, a member of the NSW Rural Assistance Authority, a member of the NSW Board of Vocational Education and Training and Deputy Chair of the NSW Women’s Advisory Council. Senator Stephens has three years to serve in the Federal Parliament and a spokesperson in her office says she will continue to chair a number of Senate Committees. I read your article about my “shock demotion” with dismay – and would like to take this opportunity to correct your reporting. Your readers need to understand that each Prime Minister has the opportunity to create Parliamentary Secretary positions to pursue important policy agendas. The Gillard Government has been shaped to pursue Labor’s second term agenda. The announcement of the nfp reform commitments during the election campaign form part of that agenda. Those issues will be taken up within her own department of Prime Minister and Cabinet and across the portfolios of Finance and Treasury. The Prime Minister has always been the Minister for Social Inclusion and has given this responsibility to Minister Plibersek complementing her role as Minister for Human Services. While disappointed that I have not been reappointed to the role, I feel very satisfied that I was able to deliver on all the responsibilities of my original charter letter for the position. I would like to assure your readers that I am not “exiting the sector” at all and will continue to represent your views and concerns in my continuing parliamentary roles. I would like to add my praise of Senator Stephens to that of others. Her hard work and commitment (and that of her staff) helped put non-profit regulatory reform on the political agenda after years of disinterest, or at least lack of constructive action. She has always been accessible and consultative. She has kept the big picture in mind and worked on building a relationship of trust between government and the sector. Her persistence paid off with Labor’s election promise of the establishment of a national ‘one-stop-shop’ regulator, the establishment of an Office for the Non-Profit Sector (within PMC), and the convening of a Non-Profit Sector Reform Council. The elevation of the Social Inclusion portfolio to a more discrete and senior position is also a credit of her efforts in raising the level of the debate. I am pleased (but not surprised) to read her comment that she will continue to work for the sector across her parliamentary duties. At PilchConnect, we look forward to working with Minister Plibersek on implementation of the Labor’s election promise, which we believe is worthy of bi-partisan and independent support!